Noise Pop and Amoeba Music continue the ever-popular and biweekly vinyl party Noise Pop Record Collective with a show this Tuesday, September 11th hosted by Sonny Smith of Sonny & The Sunsets! The party goes from 8pm till midnight at San Francisco's The Homestead. Ever since the music industry tried to quietly kill off vinyl, it appears that the medium, complete with its accompanying cover art form, has triumphantly resisted eradication. In fact, not only have records, along with album & singles & ten-inch cover art, refused to die -- they've actually grown in popularity with a whole new generation of appreciative vinyl fans. As we well know, these days vinyl sales are continually going up and it seems you can't go a week without encountering some wonderful new album cover art show somewhere. 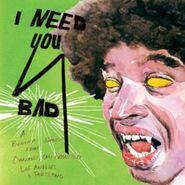 Not only are curators presenting classic album cover art on exhibition, but this week one most innovative individual is presenting an exhibit of all new & original record cover art by many different artists complete with all-new corresponding music -- fictitious songs for fictitious bands! Bay Area artist Sonny Smith (of Sonny & the Sunsets) melds his love of both music and art in a unique new gallery show titled 100 Records that opens tomorrow (April 9th) at Gallery 16 in San Francisco. The diverse & tireless San Francisco artist, who just recently returned from SXSW in Austin, TX with the Sunsets (the band he formed three years ago with Tim Cohen and Kelley Stoltz and whose changing lineup now includes Ryan Browne, Tahlia Harbour and Zack Ehrlich), spent the past year meticulously piecing together the 100 Records show in which he created the names and song titles for 100 different fictitious bands.